If you’re headed to NGS 2014, there is no shortage of opinion on how to make the most of your conference going experience. From what to pack, who to see and the “Can’t Miss” booths in the vendor hall it can all be a little overwhelming. Especially for first time conferees. 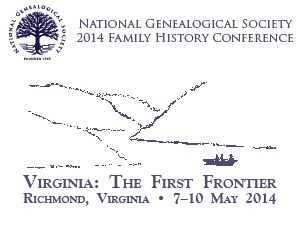 While I’ve been to other conferences, NGS 2014 will be my first experience with a National Genealogical Society event. That means I’ll be straddling the newbie/old hand fence. Here is what I’ve learned at other conferences to help shake off the first time jitters and come away with the best possible conference memories! For first time attendees this is essential to a good experience. You’ll be a little overwhelmed. There will be other conferees who will feel the same way with which to commiserate. There will be more experienced conferees you can learn from. Put yourself out there. You won’t be disappointed and you may just make a new lifelong friend. And for you more experienced conferees don’t think this doesn’t apply to you. I bet, just like me, you’ve got a long list of meet ups with the friends, clients and colleagues. Don’t forget to engage with people you don’t yet know. You may be a lifeline for a first timer or you may stumble into your dream project or client. You’ve spent hours pouring over the session list and carefully crafting an incredible learning experience tailored to your research needs. I promise you, something will come up to change that plan. Maybe you’ll make a new friend by following the advice in No. 1 and want to attend a different session with them. A speaker may have unavoidable flight or equipment trouble that may cancel or move their session. Make sure you’ve got at least one alternate session for your time slots. You can also plan to use that unexpected down time to visit the vendor hall. If you’ve got a smart phone, be sure to check out tomorrow’s post on the NGS 2014 conference app! The corollary to No. 2 is to always be flexible. I know you spent a lot of time planning your session schedule but I guarantee, you will be talked into attending a session you hadn’t considered. You’ll hear other conferees talking about a must see speaker. Or you’ll attend a session that causes you to want to follow a particular topic further. It will happen. And if it happens on the first day your finely crafted schedule will be out the window. Don’t panic, enjoy yourself and if you’ve got a Plan B you’ll be able to both embrace the spontaneity and still achieve your educational goals. 4) If you’re flying, hit the vendor hall book sellers early. You’ve probably over-packed for the conference as it is (so many of us do). Give yourself enough time to arrange for those book purchases to be shipped home so you’re not lugging them back to the airport at the end of an exciting, but exhausting, conference. In my only concession to the “What to Pack” genre of conference blogs, pack Band-Aids. Maybe you bought new shoes for the conference. Or maybe those dress shoes you only wear to church or dinner just aren’t as broken in as you thought they were. Even if you are in the conference hotel you will walk your feet off. When the inevitable blisters come, you’ll need Band-Aids to keep you moving. Plus, paper cuts! Trust me on this one. 6) Don’t forget to eat and drink plenty of water. Conferences can be a physically demanding experience and not all of us are Spring Chickens anymore. Take care of yourself during the conference so you’ll enjoy it all the way to the end and still be able to function by the time you get home. You will meet people at the conference – lots and lots of people. There will be any number of them with whom you’ll want to exchange contact information. Is your name hard to spell? Is your email address or website overly long or complicated? Is it inappropriate to give out your work business card for personal contacts? Save you and potential colleagues and cousins the hassle of hand writing out your contact information on whatever random slip of paper is handy. It will get lost. It will be hard to read. Misspellings will occur. It doesn’t have to be fancy. Card stock, a printer and scissors is all you need to create a calling card to use at the conference. And when you receive a card from someone else, take a quick moment to jot down on the back why you connected with this person or what you’ve promised to send them. By the time you get home with a stack of cards and hundreds of new faces in your memory, you’ll be glad you did. Do I even have to tell you to just enjoy yourself? Rorey’s biggest Rule for Genealogy Conferences is to have fun! I do so hope to see you there. I’d be happy to be the stranger you talk to so please don’t hesitate to say hello. And for you other old conference hands reading this, what have I missed? That is exactly how we met. I didn’t know a single other conferee that first year so everyone was a stranger.